Many of us are busy preparing to ring in the New Year. But in the rush of the holiday season, did you take time to review the year that’s quickly coming to a close? Before you sing Auld Lang Syne, and this year’s events and activities are forgotten and “never brought to mind” again (like old acquaintances) - take stock of what’s happened and what we’ve learned in 2013 that might better prepare us for the year to come. Was it a wild ride in 2013? With the year coming to a close, Joanne Fritz, the Nonprofit Blog Carnival host for December, asked us to blog about “trends and resolutions for 2014, or recap the trends [we] saw in 2013” to offer up an idea of what our “ride” will look like in 2014. However - spoiler alert - this post doesn’t offer any prophetic insight into trends for the coming year. But after looking back at many of the most viewed or most popular blog posts and articles, we thought we'd share some of the key ideas or themes that emerged that resonated with non-profits and membership organizations this year. New Year - new plan or back to basics for 2014? Our world moves at lightning speed. Staying constantly connected, filtering information and keeping up on new technologies or social networks can be exhausting. 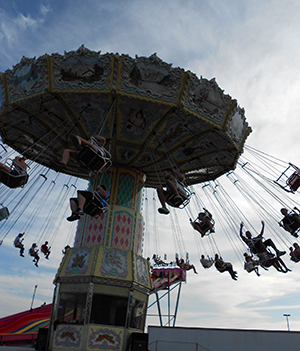 In fact, the fast moving carnival ride image is a fitting metaphor for those staff and volunteers of small non-profits, charities and membership organizations who are struggling to keep up with all of the changes that might impact their work and their mission. As exciting as the ride is, it can make us dizzy, with the world flying by so fast. But while it’s important to pay attention to trends, when I thought about messages that stood out this year, the old saying - “the more things change, the more they stay the same” really applied. To take a line from one of our “Favorite Posts of 2013” (from Claire Axelrad) “...Sometimes moving forward is just going back to the basics.” Before you go in a new direction or try a shiny new tool, it's important to be sure you’ve got the basics covered. The following three key themes or ideas emerged from among the top rated and favorite posts I read this year. As you’ll see, the subject matter isn’t new or trendy – it’s about as basic as it comes. But we thought it might be worth repeating and worth considering as you make plans for the New Year. This year (and every other too) there were many posts and articles about the importance of maintaining the support of existing donors and members. This means reaching out to welcome newcomers as well as finding ways to keep them connected to your organization and your cause. And even though it can be challenging to cut through the clutter, research continues to demonstrate that folks still value face-to-face and personalized contact and they certainly want to know that they’ve made a difference. It’s just a question of determining how to best connect with all of your donors, members or supporters – finding the right combination of communications channels, whether that’s through traditional means, through social networks, or finding ways of building community through your website. There will likely be a lot of new and exciting trends and technologies in the coming year. But it’s also important to remember that “what goes around comes around” – if you get at least these three basics covered, you’re bound to have a wonderful ride in 2014.